Fiction – paperback; Penguin Modern Classics; 187 pages; 2000. The late John Wyndham is probably best known for his science fiction classic The Day of the Triffids, a post apocalyptic novel in which the world gets overtaken by carnivorous three-legged plants. 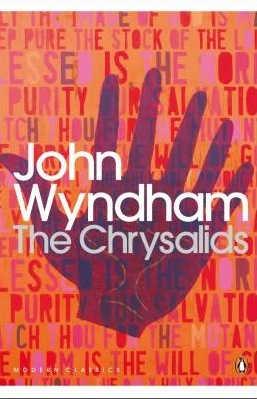 But it’s The Chrysalids, published four years later, in 1955, which most Wyndham fans say is his best. I read all his major novels (there are seven) when I was in my teens and loved them with a kind of evangelical devotion, but how would this one stack up more than 20 years later? Strangely enough I had forgotten so much of the detail of The Chrysalids I began to wonder whether I’d actually read it before. It felt very fresh, very new and, surprisingly, very modern. The setting is typical Wyndham fare: a post-apocalyptic world a few thousands years in the future. But in this case society has regressed to the point of living a rather primitive frontier-like existence reminiscent of 18th century pastoral America. There is no technology here, no cars, no electricity. The houses are basic, constructed of wood with thatched roofs and whitewashed walls, and everyone works hard to provide a stable supply of stock and crops. But all is not as it seems. This is a society obsessed with fundamental Christianity to the point where anyone not born in the true Image of God is regarded as a blasphemy to be dispatched at birth or condemned to live in the Fringes, a wild untamed area where other rejected “humans” roam. Even the crops are carefully monitored to ensure they do not deviate from the norm; whole fields are burnt if the plants do not look right. And if anyone has any doubts as to whether a particular plant or human is abnormal, there’s an inspector to play judge, jury and executioner. The story is narrated by David, the 10-year-old son of the local religious leader, who is indoctrinated to “watch thou for the mutant!” and “keep pure the stock of the lord” amongst others. But when David befriends Sophie, a girl hiding the fact that she has six toes on each foot, he begins to question his religious upbringing. Later, when David realises that he has a rare talent for telepathic communication with his half-cousin Rosalind and several other children, he realises that perhaps he, too, is a deviant, and is careful to hide his ability. This group manages to avoid exposure for several years, but then two factors threaten to “out” them: one of the group marries a normal person, and David’s baby sister, Petra, discovers that her telepathic ability is so strong that she can communicate with a woman from a more technologically advanced society. I don’t want to provide any plot spoilers, so I’ll refrain from telling you any more about the narrative, but it’s an exciting one, a kind of weird blend between boy’s own adventure story and literary thriller. Despite being written more than 50 years ago the story seems incredibly relevant to our modern-day obsession with appearance and genetic modification, although, as John Harrison points out in the introduction to this edition, it’s clearly a novel of the 1950s, when “molecular biologists were unwinding the DNA spiral; the new science of radio astronomy had filled the sky with invisible objects; quantum physicists were able to reveal that God does, after all, play dice with the universe” and everyone was living in the shadow of the hydrogen bomb. I agree entirely – except I’d give it five stars! For me it is this book, and not Triffids or Midwich Cuckoos, which is Wyndham’s masterpiece, and as you say, it’s frighteningly modern. I also loved the fact that when you begin reading it, you can’t quite work out if we’re in the past, future, or another world altogether. Strange, I read this too when young – and the only bit that rung a bell here was Sophie with the six toes. The rest just seemed vaguely familiar. It does sound great though, and definitely worth another look. I know I loved them when I read them first and expect I’d see different things in them today. I read and reviewed this one earlier this year after reading so much about it on Mr. Self’s site. I was also suprised to find it so modern/current. It is a novel of the 50’s but I’d hesitate to call it a “novel of the 50’s.” It’s relevance to today’s world is just too great for that. Think of how many people use genetic testing to determine whether or not to continue a pregnancy and the influence of fundamentalist religions both Christian and Muslim pervades society today. I hate to say, but I found the book hit a bit too close to home for comfort. This is definitely my favourite of Wyndham’s as well; I have read it a couple of times and think I’m due for a reread quite soon. You have reminded me of just how good it is! I have only read The Midwich Cuckoos, earlier this year, and bought The Day of the Triffids to read recently, but after reading your review I now know that I have to read the Chrysalids as soon as possible! You’re right — when you read this you’re not quite sure of the time period, because in the opening paragraphs David dreams of cities and shiny fish-shaped things in the sky, but he has no idea what he’s seeing. Is he dreaming of the future, or the past? Thanks for the link. I agree about the religious overtones of this book: it’s basically mirroring the fundamentalism we see in Christianity and Islamism today. Quite scary, really. And what did you think about the genetic modifications mentioned: the giant horses, for instance? Made me realise Wyndham was extraordinarily prescient. The poor chap would probably die if he knew there were cows out there today that are three times the size of ordinary cattle, reared without fat to produce gallons of milk. And that there are pigs that glow in the dark, and goats that produce spider’s silk, and goodness knows what else. I only skimmed this because APOCALYPTIC!! CLASSIC!! WHEEEEEEEEEEEEE! Which is to say, I’ll be picking this up soon. I quite agree. It’s a wonderful novel that still stands up today; far superior to The Day of the Triffids.